HATUEY: Memory of Fire is a soaring Cuban-Yiddish opera, a story of love and heroism set in a Havana nightclub in 1931. Oscar, a young Jewish refugee writer who escaped from pogroms in Ukraine to make a new home in Cuba, falls in love with Tinima, a beautiful singer of Taino descent and passionate revolutionary. As Oscar pens an epic poem about Cuba's legendary freedom fighter, Hatuey — the Taino chief who died at the stake resisting the Spanish in 1511 — Tinima draws him into her fight against the corrupt, dictatorial Machado regime. The two stories intertwine as characters shift in time and place, from Havana club in 1931 (sung in Spanish), to the world of Oscar's poem in the forests of Eastern Cuba, 1511, (sung in Yiddish) where Oscar's hero, Hatuey, encounters Velasquez and the invading Spanish colonialist army. Hatuey is a folk hero revered for many generations in Cuba and the Dominican republic, exemplary in his fight for freedom. In real life, Oscar was Asher Penn. According to The Forward, "In 1931, Yiddish poet, journalist and editor Ascher Penn published Hatuey, a 126-page epic poem about a Taíno chieftain who fought against the Spanish invasion of Cuba at the beginning of the 16th century, and who was eventually burned at the stake in 1512. Born in 1912 in Ukraine, Penn immigrated to Cuba in 1924 following a pogrom in his native shtetl of Gaysin. In Hatuey, Penn drew on the experience of the pogrom to describe the massacre of Taíno natives by the Spanish, and expressed his admiration for Taíno history and culture." Hatuey: Memory of Fire springs from Penn's narrative poem Hatuey; the opera, a vibrant fusion of Afro-Cuban and Yiddish music and culture is a powerful celebration of human dignity and struggle for freedom performed in English, Yiddish, Spanish and fragments of Taino, with English supertitles. With music by Grammy-award winning composer, Frank London of the Klezmatics, and libretto by Elise Thoron, Hatuey: Memory of Fire draws on different musical traditions – classical opera, salsa, music theater. It is composed for seven principal singers, nine singer/dancers, and nine musicians; the orchestra (piano, three percussionists doubling on Afro-Cuban percussion and Western classical percussion instruments including mallets, bass, flute/sax, trumpet, clarinet/sax/flute and cello) are be able to shift between different musical styles and genres, especially 1930's Cuban club music and contemporary classical music. An initial, abbreviated Spanish language production of Hatuey: Memoria del Fuego with Opera de La Calle (a company of 60 + performers) opened in Havana, March 3, 2017 at Teatro Arenal. This 72 minute production in Spanish, directed by Artistic Director Ulises Aquino, a landmark in USA –Cuban collaboration and development of a new work, had many performances and became a part of the Opera de la Calle repertory. The 90 minute complete production Hatuey: Memory of Fire with book in English and opera sung in Yiddish, directed by Mary Birnbaum at Peak Performances, produced by Diane Wondisford, Music-Theatre Group, opened to critical acclaim and sold out houses September, 2018. 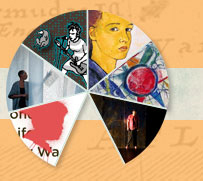 Hatuey has benefited greatly from developmental workshops with Music-Theatre Group, and the Sundance Theater Program, with a Sundance residency at the Ucross Foundation and at Sundance Lab at Mass MoCA, and also creative residencies at Pocantico Center with The Rockefeller Brothers Fund and at the Hermitage Artists' Retreat. It is the first Yiddish opera to receive a full staging in a century. One of my favorite musical collaborators, Frank London, came to me with the idea for an opera in a Japanese restaurant on the lower Eastside; he pulled out the original edition of an epic Yiddish poem Hatuey, published in Havana in 1931. I was probably one of the few people he could go to who would respond: "Oh, Hatuey, the Taino freedom fighter who died at the stake, killed by the Spanish in 1511 in Cuba, originally from Quisqueya…" I learned this working on Junot Diaz's The Brief Wondrous Life of Oscar Wao; Oscar's family home is called Casa Hatuey… and yes, there is a great footnote. 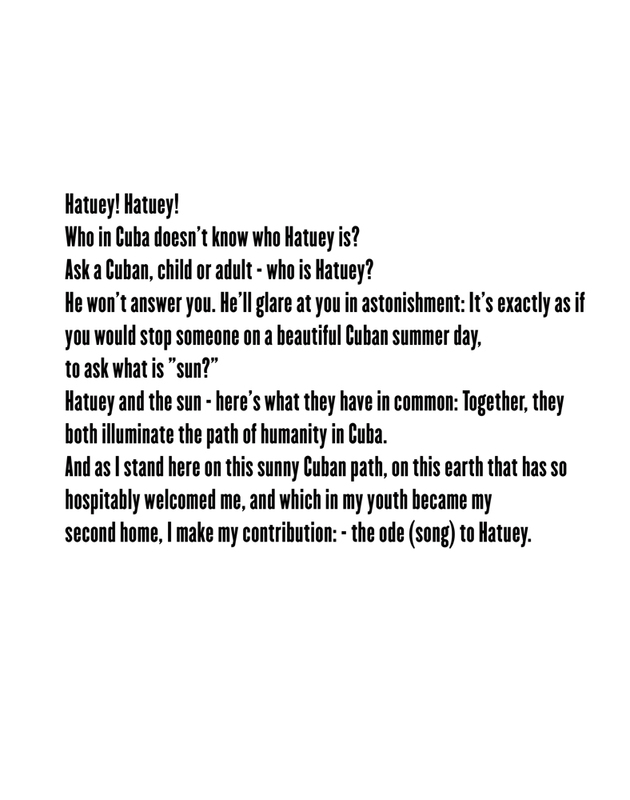 I then learned that Hatuey the poem was written by a 24 year-old Ukrainian-Jewish refugee, Oscar Pinis (later Ascher Penn), who dedicated the work to Cuba, the island where he found refuge from the terror and devastation of the pogroms that killed friends and family. The poem was translated into Spanish in 1935, and was taught in Cuban schools, although few are aware of its Jewish/Yiddish roots. The Slifka Center for Jewish Life at Yale hosted a colloquium exploring the various cultural, historical, linguistic and musical aspects of Hatuey that included prominent Yale faculty, and representatives from the Foundation for Jewish Culture and the Yiddish Forverts; and commissioned English translations from both the Yiddish and Spanish translation published in Cuba 1935 and taught in schools there. 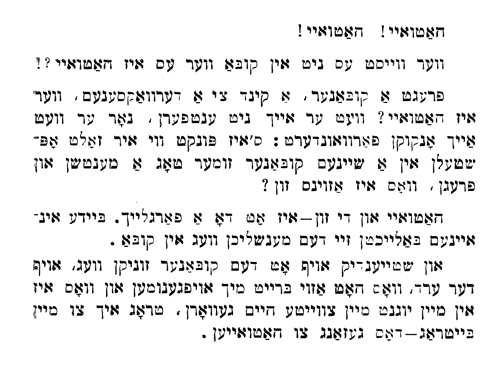 Shane Baker of the New Yiddish Rep recorded the Yiddish text of the poem Hatuey for use in the creation of the libretto. Jorge Estevez of the Smithsonian Museum of the American Indian, scholar of Taino culture and language, talked to us about the Taino culture present in everyday life. I also interviewed the poet's daughter, Elaine Posnick, who served as her father's literary secretary in his later years. The challenge for me was to find a dramatic structure that could fuel an opera, but would honor the various languages and cultural traditions at play. 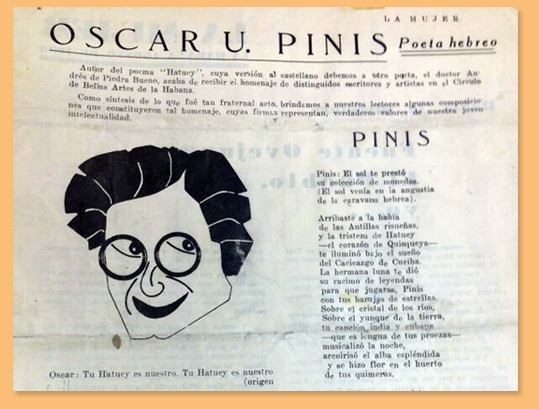 What emerged is two intertwined stories of the poet, Oscar, in 1931 writing his poem in a Havana nightclub, and the poem itself, Hatuey, which takes place on the Eastern shore of Cuba in 1511 and is sung in Yiddish. It was a crazy enough idea in three languages, and Sundance Theater program both gave us time and space to work together at Ucross, and then a workshop with an eclectic group of amazing actor/singers from different traditions as a proof of concept at Mass MoCA. We all enjoyed what we heard and felt in the room, so have forged forward with the insight and support of Diane Wondisford and Music Theatre Group. A guiding light in our work on Hatuey is Michael Posnick, the poet's son-in-law, extraordinary dramaturg, wise soul, and fund raiser, whose amazing spirit and warmth carry us forward. 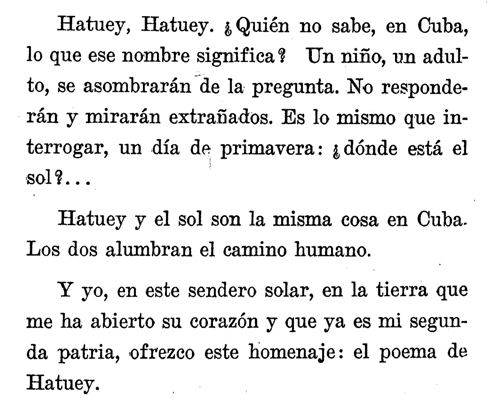 The poem Hatuey was written in Yiddish in Cuba by Asher Penn, who immigrated to Cuba from the Ukraine as a sixteen year old to escape pogroms. As a child, he witnessed his friends and family killed by Cossacks. While he never mentions his experience in the poem, one feels its presence in the forceful invective against violence of the Spanish and celebration of Hatuey as freedom fighter. The 125 page poem was translated into Spanish, soon after it was written, taught in Cuban high schools and colleges. Now, to facilitate our working on the opera, there is an English translation by Moisha Rosenfeld.